Everton manager Marco Silva believes his side's victory over Leicester provided further vindication for his team selection during the club's Carabao Cup exit. The Toffees were beaten on penalties by Southampton in the fourth-round tie on Tuesday night, but Gylfi Sigurdsson's brilliant strike helped Everton respond to that setback with a 2-1 win King Power Stadium. Silva was criticised for making seven changes against Saints, but the Portuguese once more defended his decision to field a depleted line-up, which he believes helped his side record all three points on Saturday. 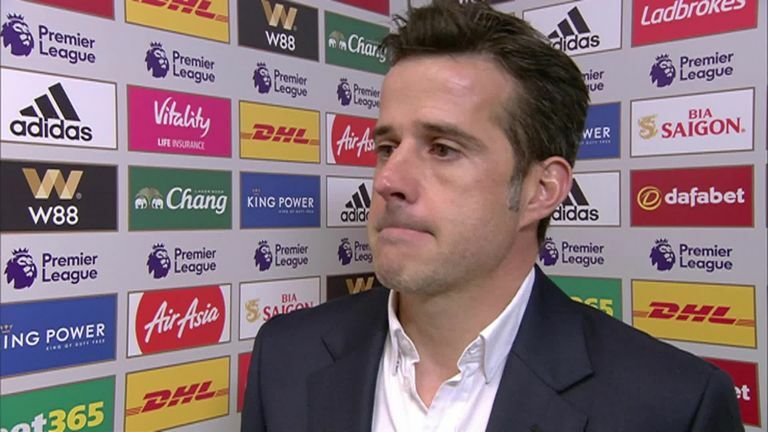 When asked by Sky Sports' Patrick Davison about the changes he made to his side, Silva responded: "I understand your question about midweek, I don't know why. "It's not important to talk, but I can tell you we played with enough quality in the middle of the week to win the match. "If you change five, six players, our opponent changed as well, and we had enough quality to win that match. We are creating here a winning mentality, and all of our players have to be ready to win, if I change one, two or three. "This afternoon the way Gylfi and Gana [Idrissa Gueye] performed, it looked like they were fresh. Of course, Bernard gave different things to our squad, and of course Richarlison is a fantastic footballer, and can give good things to us as well." Silva believes Everton deserved the win at Leicester, but admitted his players need to stop gifting the opposition with chances. Silva added: "I think the win was deserved. Since the first minute we showed what our goal was coming here. We didn't come here to play in the middle but to press. We created many problems for them and had fantastic chances to score a second goal. "During the first-half, we were the better side on the pitch but we still have to be more mature at this level, the way we conceded from an offensive corner to us. "In that moment we have to kill the offensive transition in a different way and that's something we have to improve as sometimes we gave them gifts and at this level you can't do that. "It was more balanced in the second half and we showed good organisation. We controlled the ball with the extra man and it was a fantastic goal from Gylfi. Our fans were fantastic this afternoon and we deserved the win."